Content Development is the gold statement in the internet publishing and race to be on top of search engines and the first page of search results. The emerging role of content is affecting top brands, top publishers, and long-standing enterprises. Consumer engagement and approach to influence consumer-buying decisions turned out to be a game of quality content presentation and distribution for reach. “Content is King”, you must be heard this statement before. Yes, it is true. Educational content about products and services is a major influencer driving consumer engagement to take action. Writing content for consumers is a vehicle to build an audience rather than quick-hit audience acquisition through advertisement. People are looking for informative content that delivers rich and intense information about product features, service offering, how to use those products and services. Informative content is not limited to feature listing and product benefits, it has gone further miles ahead with the phrases like “How to”, “Hacks on”, and “Learn More”. Products and services that rank on the top are those who fill the internet websites, forums, social media channels and email newsletters with those buzzwords “How to”, “Hacks on” and “Learn more”. Products consumers are always struggling to make the best utilization of their money; consumers are abandoning many products and services with little to none availability of content about product or service around the consumer reach. How people read the content? The attention span of Internet users is limited to a few seconds to find what they want. After opening a specific page to read something, that page gets less 15 seconds of reader attention before deciding to leave out. Most of the web users will have a quick look into the left side of the page looking for their target before turning back. Majority of the users will have a look at the first part of the page, although they will scroll down, however, their attention span is reducing quickly while they are scrolling looking for information, especially with mobile users. The good information, that visitors who spend more than 3 minutes reading a page, will likely return back to the same website or page looking for more information. Among web users who spend the time to read, 20% of users will read 20% of the text, and 10% to 20% of those readers will read the entire text. People develop opinions about brands, and products names after reading more than 15 seconds. Storytelling style with well-structured information presentation will get more than 100 seconds of engagement of reading by web users. How People Read Content Online is an infographic showing a study of people behavior reading and consuming content. Content First or Design First? Neither is first. They both should move the hand in hand. Putting the content before design takes business teams nerves to come out with clear and focused words towards their goals. If a business has not defined its goals of the content for their website, a design comes handy to spark the ideas and generate more words to fill out gaps. Developing content is tedious work for writers who do not have a proper foundation of targets to achieve, a design sketch or mockup definitely will spark writers to have a vision and framework for their content. Regardless of constraints imposed by design sketches, good writers are able to work within design constraints and innovate. On the other side, waiting for designers to come out with good design is waste of precious time to be on the market, those months of delay can be utilized to generate content, drive traffic to the website, and establish engagement with target audience. The endless process of design revisions could delay time to market while pushing designers with effective content to fill out their design and gain more understanding of content strategy will improve design revisions; developing content and design is not a joyful process, it a process full of frustration between content writers and designers. Millennials trust recommendation from strangers, they read their peers generated content, they read comments; they read reviews before making a decision to buy something. Millennials have abundant time beyond elders, unlike elders do; millennials prefer to read digital content. The fact of millennials are not reading is not true; they prefer reading digital content rather than watching the news on TV. Millennials are consuming YouTube videos more than elders are, they consume material with stories that stroke their interest, material that build their skills, material that help them to make an opinion about a product or a service. Millennials consume content differently, they are searching for content and skim through it quickly; and then they will search for other relevant content that supports the first, and so on. They develop their decisions based on their peers’ (known of strangers) recommendations from social media channels and then support it with material from the web. Millennials are clever and innovative, do not underestimate their skills; they are native internet users, unlike transformed users who have the skills to read printed material. Content is a revenue generation stream. It is not hard to believe that fact when you read about a giant making hundreds of billions of dollars investing in one of its products and convert its content into revenue generation stream. The story of Microsoft with Minecraft content started as a hobby and turned out to actual business with an established marketplace. They hobbyist community started by enthusiasts to host readymade Minecraft jobs for others to consume; turned by Microsoft into the marketplace for selling those jobs. Microsoft claims that it is its responsibility to ensure the safety of its predominantly young audience and avoid alienating its Minecraft community members. The fact is they are focusing on increasing their revenue through guidance and control of results. If Microsoft is envisioning solid cash flow coming from the content, they will not put efforts and invest money into developing a special marketplace for this type of content. A large portion of customers would learn about a company through an article online. Several examples illustrated in Andrew Gazdecki article demonstrating small businesses who were able to make leap difference and success by focusing on their content development and marketing strategy. 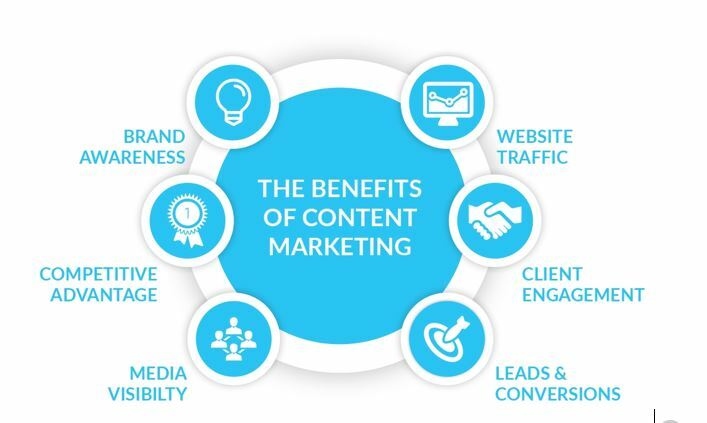 Small businesses can build themselves faster by developing content. In a world of tough competition, content is the foundation for small businesses to establish themselves as an authority in their field. The big player is efficient in this game, but a small business can compete with less cost and time. Independent Web page with an owned domain name, small business should not rely on making their pages on Facebook, Linkedin, or other free services. Email is a big player driving customers to websites, it is one of the best ways businesses use to connect with their audience. Email traditionally used as a channel for sales instead of sharing brands’ content, however email remains number one tool to stay in touch audience. Enriching email newsletters with focused statements driven with “Call to Action”, and good visual presentation of content coupled with images and videos, is important to urge readers to take action. Email marketing is permission-based of the consumer consent approval to receive marketing and informational emails. Email is the tool that provides marketing teams with clear intention about consumer willingness to receive more information. More than that, consumers are requesting more information when they sign-in into newsletters offering extra products and services information communication and updates for the consumer benefit. Mixing good presentation with content in email, by keeping it simple, including relevant visuals, and using branded color scheme, along with tags; is necessary to make a constant and immediate impact on email readers. Personalize emails to earn trust, readers must believe in your work by putting their name first.